Steiff Numbers Counting Game, from the Happy Farm collection, is made of beautiful soft white multicoured plush for a baby's delicate skin. 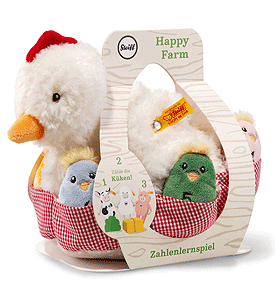 The 20 cm Happy Farm Numbers counting game is a great idea for a gift. The red and white chequered material with six pockets is draped around a Mother Hen with six chicks in a basket. Each chick has a number stitched onto its tummy. The chicks can be taken out and put back again. This trains babys motor skills. Later, your little darling can learn numbers and colours with playful ease. Mother Hen and her six chicks are made of cuddly plush for soft baby skin. The eyes are stitched on.